Grus Spiral Trio. 36 hours total exposure. 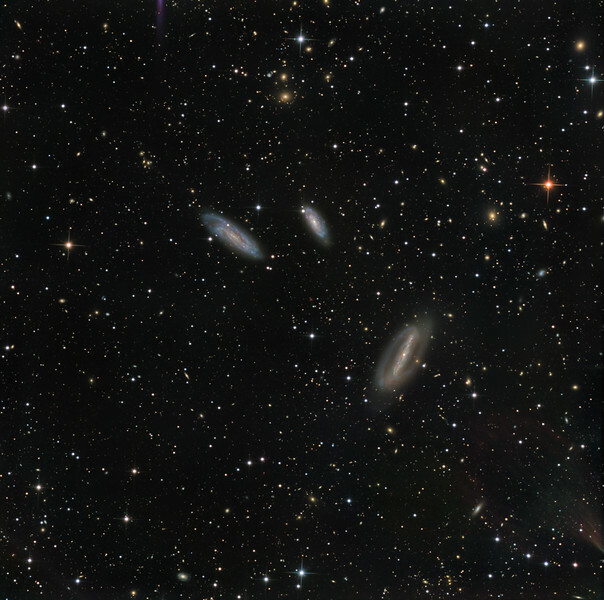 Processed to show the colour and form of the myriad background galaxies. Lots of red ellipticals. Lots of edge-on spirals. A few rare Magellanic bluish, gritty, fellows. We counted 273 definites, and as many again probables. Lum: 18x1hr unbinned. RGB: each channel 6x1hr unbinned. Field 36 min arc. Aspen CG16M on 20" PlaneWave CDK on MI-750 fork..